Normally £175, this ready to ship corset is just £80! The front lacing corset is a brilliantly simple, elegant and versatile corset. It is one of our favourite types of corset for everyday wear or underwear because they are so comfortable and adaptable to any situation. You can wear these under or over clothing and having the lacing at the front can be so handy on some occasions. It is made using all the historical techniques that you would expect to find in a quality corset with several layers of specialist fabrics, steel boning throughout and two part eyelets set in re enforced, double boned channels for tightlacing, being designed to reduce the natural waist by four inches. Please enter and double check your email address so we can answer your question. If your email address is incorrect we will have no way to contact you with a reply. Feel free to ask us about this product, appointments or anything else you would like to know. 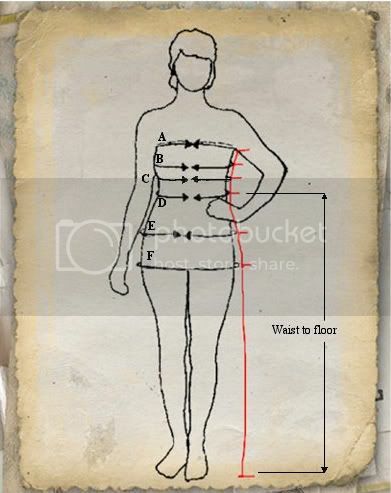 The next two diagrams are designed to help show you where to take your measurements and to show a little more about what they mean in relation to your corset. Measuring the length of your body at precise points ensures the most accurate and comfortable fit. Measuring around your body, holding the tape measure firmly but not too tight, it shouldn't interrupt the line of the skin or the corset may pinch. Make sure that the tape measure is even and level right the way around your body to ensure the most accurate measurement. A - Chest - Where the top line of the corset will sit. B - Bust - The widest part of your natural bust. C - Underbust - Where your bra strap would sit. D - The narrowest part of your waist, usually about 2 inches above your belly button. E - High hip - To accurately gauge the curve from the waist to the bottom line of the corset. F - Full hip - The widest part of you hip where the lowest points of the corset will sit. Measuring down the side of your body, take care to be as accurate as you can, take the measurement from the same level as you took the horizontal measurements. 1 - Chest to bust. 2 - Bust to underbust. 3 - Underbust to waist. 4 - Waist to high hip. 5 - High hip to full hip. Of course, do feel free to contact me with any questions or leave a comment here, the more the better, it's so worth it to make sure that we get everything perfect! At Bound By Obsession, we stand by the laws set out by the UK office of fair trading in distance selling and take pride in upholding your rights as consumers. If in the unlikely event that you are not happy with your garment, do just send it back, please inform us as soon as possible so that we can make the transaction as smooth as possible for you. We may request a little information for identification and security. We can only send refunds directly to the bill payer, the contract of sale is not transferable. We will need to have received the returned item before completing the refund or exchange. You have 14 days from receipt of a stock garment to return it in its orginal condition with labels and tags still in place and unworn for a full refund or an exchange. You do not need to give a reason but we would appreciate the information. Although made to order garments are classed as custom work, we choose to offer refunds and exchanges anyway. Please be aware that refunds may take a few days to process. We can not accept returns for custom work. You have 14 days from placing a custom order to cancel, however the cost of any work carried out within those two weeks will have to be covered. Please take care when taking your measurements for custom garments, we will make alterations and would never leave a customer with a garment that didn’t fit them correctly but this could increase the costs for you. If you are unsure about any aspect of the measurements, please do get in touch, we are happy to spend as much time as you need helping with the measurements. Shipping is free anywhere in the world!!! Items going to the UK will be shipped via royal mail special delivery if there are any disruptions we will use a courier. Items going abroad will be shipped via Royal Mail Airsure, again if there are disruptions we will use a courier.